This "brick road-printer" was created by Dutch manufacturer Tiger Stone; it can output 400 meters of road per day in spans of up to six meters. The bricks are assembled in a desired pattern and then laid down efficiently. Ahead... was the perpetual train. Judah had walked its length, skirting the crews. it was a rolling-stock town, an industrial citylet that crawled. At the end of a no-man's-land of empty rails, he saw the work. New Crobuzon reaching so far. The leviathan unfolding of metal, the greatest city in Bas-lag rolling out its new iron tongue, licking at the cities across the plains. Fans of Alfred Bester's spectacular 1956 novel The Stars My Destination will recall something similar. A heavy truck rumbled down the lane. Six men were tumbling baulks of timber out of the back of the truck. Following them came a crew of twenty arranging the baulks neatly in rows. A giant machine, bellowing and pounding, approached crawling over the ties. Behind it were deposited in parallel rails of welded steel. Crews with sledges and pneumatic punches spiked the rails to the timber ties. The track was laid to Presteign's door in a sweeping arc and then curved away. The bellowing engine and crew disappeared into the darkness. A shrill whistle sounded in the distance. Down the tack came a man on a white horse, carrying a large red flag. Behind him panted a steam locomotive drawing a single observation car. The train stopped at Presteign's door... A lady and gentleman in evening clothes descended. "Shan't be long," the gentleman told the conductor. "Come back for me in an hour." 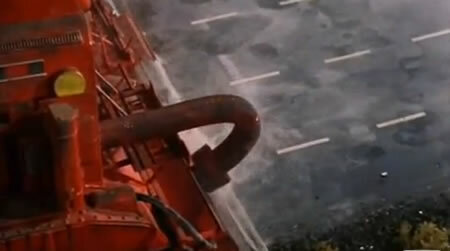 Update: A reader points out a road-laying machine in the Thunderbirds episode "The End of the Road". 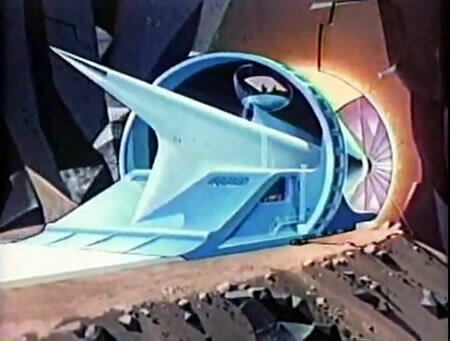 Update: 19-Nov-2010 In the 1958 Disney program Magic Highway USA, an atomic road building machine bores through mountains and melts stone for a perfect road bed. Click the link to see the movie; there is also a bridge road bed-building machine. End update. Via BLDGBLOG. Thanks to Meditating Bear for the tip on this story.